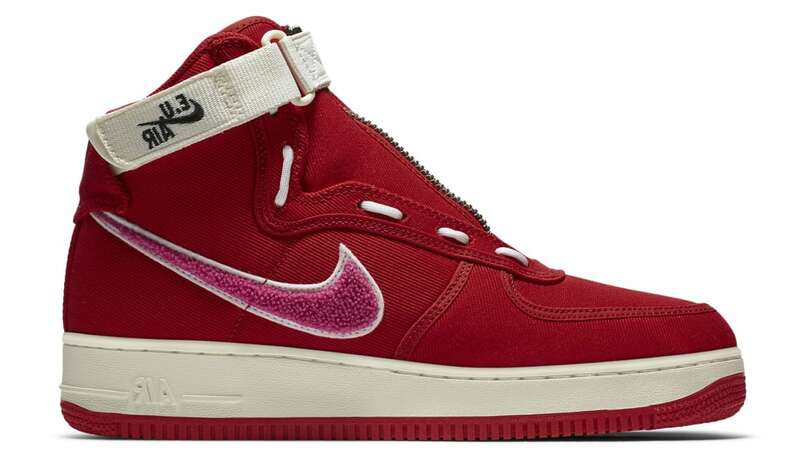 The Emotionally Unavailable x Nike Air Force 1 High collab will don a red canvas upper with pink chenille Swooshes outlined in white. A cream-colored nylon strap features a special version of the Nike Air logo reading "E.U. Air" with the same remixed branding also appearing on the tongue tag. Emotionally Unavailable's signature melting heart logo is stamped on each inner tongue. Release date is Mar. 14, 2019 at a retail price of $160.